Lonely benches have a lot to say. Nice shot and words. Hi Harrie, they sure do. Nice ending to that poem, one of which I had not read by Frost. Thanks for sharing that and your beautiful evening image! Hi Brett, thank you. I’m glad you liked the poem. I enjoy his work very much :). The clouds in this sunset were part of the storm that produced the tornadoes that swept through Illinois last Sunday. It was a beautiful, swirly sky. 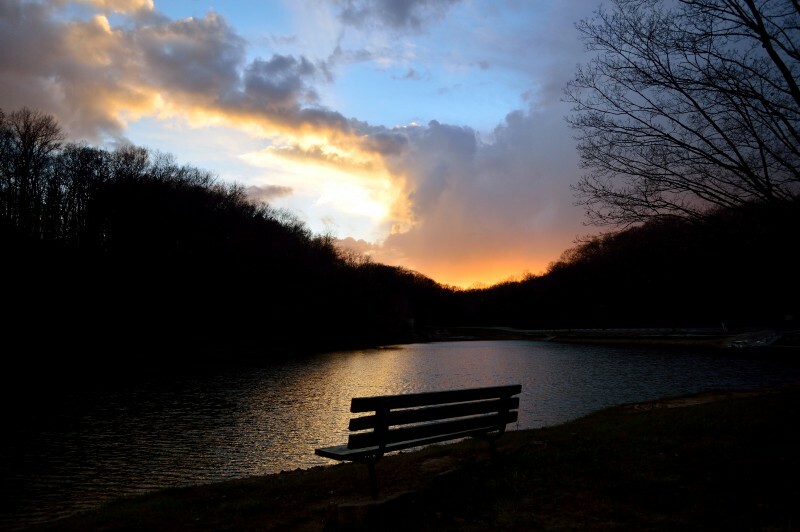 With your camera set to a 10 second delay shutter speed with it sitting on top of a tripod you could have walked over and sat on the end of the bench in silhouette. I love the sky, full of colour and moody. I’m not much on blog self portraits, but that’s a wonderful idea and one I’ll keep in mind for the future! Better yet, find someone else to sit on the bench………yes, that would be so lovely in silhouette. Don’t know if you heard, but our part of the Midwest was recently pummeled with destructive tornadoes. This shot (and “pink light”) are from the same system that did terrible damage about an hour from here.